Texas and the Ferris family have a long, intertwined history. Both the Jeffrey Ferris lineage and the Zachariah Ferris lineage have made important contributions to the Republic and to the state. This is the story of the descendants of Jeffrey Ferris, however. Warren Angus Ferris belongs to the other lineage and will not be found here. Justus Wesley Ferris was born in Hudson, N.Y., to Rev. Philo Ferris and Nancy Maria French in March, 1823. His is Jeffrey’s fifth great-grandson through Joseph. He may be one of the few Ferrises to graduate from Transylvania University, located somewhat oddly in Lexington, KY. Justus studied law and moved to Texas in 1847. He married Mattie Crow in 1850 and they had two children, Royal Andrew and Thomas Almond. A Democrat, he was elected to the state legislature for a term in 1852. He later moved to Waxahachie. 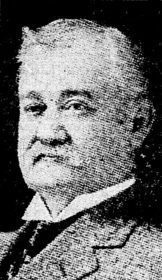 In 1861 he was selected a judge in the 16th Judicial District and served in that position until after the end of the Civil War. Returning to the private practice of law, he was one of the founders of a bank that later became Citizens National Bank. He served in the Texas Constitutional Convention of 1875. Along with devoting time to the law, and to the bank, he continued his interest in politics and was a delegate to the 1884 Democratic National Convention in Chicago which nominated Grover Cleveland. Justus died at home in Waxahachie in 1899. The town of Ferris, TX., was named for him. Royal Andrew Ferris was the oldest son of Justus Ferris. He was born in 1851 and died in 1929. 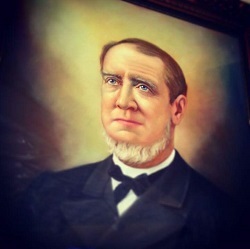 In the 14 years between his joining the family banking business and his move to Dallas in 1884, he had many successes. He helped finance the railroad that opened Waxahachie. He helped organize the local business association, and served a term as a city alderman. When he moved to Dallas, he continued his successful business career. His banking career culminated in serving as president and chairman of the board of American Exchange National Bank of Dallas. He purchased the local street-railway system, and financed its move from horses to electric. Royal was married in 1882 to Lula Brown who died just eight months after. He remarried in 1894, to Mary Brown, and they had one son, Royal A. Ferris, Jr. He died at the age of 77 in 1929. Ferris Plaza in Dallas is named for Royal Ferris. Thomas Almond Ferris was the youngest son of Justus Ferris, born in 1861 and died in 1930. He stayed in Waxahachie and made a career in banking. Thomas first married Sallie Thompson and they had two sons, Floyd Almond Ferris and Justus Wilson Ferris. After Sallie’s death in 1915, he remarried, Annie Jones, in 1927. I’ll continue this story in a second post, where we’ll meet the children of Thomas and Royal.